“You must do something to make the world more beautiful,” said her grandfather. This quotation is taken from a popular children’s book by Barbara Cooney, Miss Rumphius. Her grandfather gives this advice after a very young Miss Rumphius tells him that when she grows up, she wants to go to faraway places and then live beside the sea. “That is all very well, little Alice,” said her grandfather, “but there is a third thing you must do.” When Miss Rumphius grows up, she does travel to faraway places and then lives by the sea, but also, as advised by her grandfather, seeks to make the world a more beautiful place. She decides to scatter lupine seeds in the wild during her walks, providing beautiful purple patches of color where she lives. The message from Miss Rumphius is something kids and adults can both appreciate. Whether growing wildflowers, planting herbs in a window box, setting up a full-fledged raised bed of lettuce, or raising crops of corn, gardening has an impact on your children and their world that’s undeniable. As with many activities, if you include kids from the beginning of the process, they’ll be more likely to stay interested, have fun, and participate. So ask your child what kinds of plants and/or flowers they would like to grow. During the discussion, help guide your kids by mentioning the climate and how the planting location will affect growth. Let them know what plants and flowers grow successfully in your region. Also, tailor the gardening tasks and plan to your child’s age. 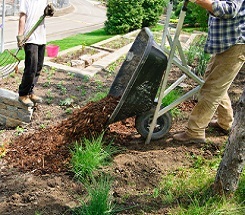 Small children can easily scatter seeds, water plants, and pick fruits and vegetables, while older children can help with more physical, labor-intensive garden projects such as building raised beds, weeding, digging, and harvesting. Remember to keep it simple. Your garden doesn’t need to be a complex project to make it interesting and satisfying. If you live in an apartment, herbs and flowers in window boxes are fantastic. Community and rooftop gardens are also wonderful options. If you have a yard, you can use one section to raise some vegetables, or even just plant a couple of trees that your child can tend to. Kids will also enjoy how gardening is a focused, physical, outdoor activity that they can do with a parent or the whole family. Together, you’re working toward a common, easily understood goal—to work in a process that leads to the growth of beautiful plants, flowers, or food. It’s also a goal that they can see requires patience and work. Best of all, your kids will probably love just having fun with dirt. In an age of omnipresent hand sanitizers and constant messages to keep clean (I’m just as guilty as any “germophobic” parent), kids will love that they are encouraged to work with dirt and mud, and appreciate what it can do. Another key positive of gardening is that it provides another opportunity to get your child outdoors. Study after study these days indicates kids spend too much time in front of the computer or on some other electronic device. Gardening keeps them from being constantly “plugged in” and allows them to appreciate the natural beauty of helping and watching something grow. Planting and caring for their gardens also enables kids to realize the impact of what they do on a daily basis and how that can affect the quality of their garden and the environment at large. If there’s pollution, or chemicals in the soil, this is going to affect the garden. In fact, it is advisable that if you live in an urban area, you should have a basic soil assessment done to test for lead and other contaminants and check that your garden site is safe for kids to work in. One of the best things of all, if your garden produces edible items, your kids will love eating what they’ve helped grow. Picking and eating fresh raspberries from a vine, pulling radishes out of the soil, and carving for Halloween a pumpkin you grew yourself is satisfying for young and old—not to mention cost-effective! My youngest daughter still talks about the butter lettuce and the skinny carrots her class grew in her school garden. Bring gardening home to your child and watch them enjoy the mysteries of nature. They’ll appreciate what they’ve accomplished, and, taking a lesson from Miss Rumphius, the world will be a more beautiful place because of it.